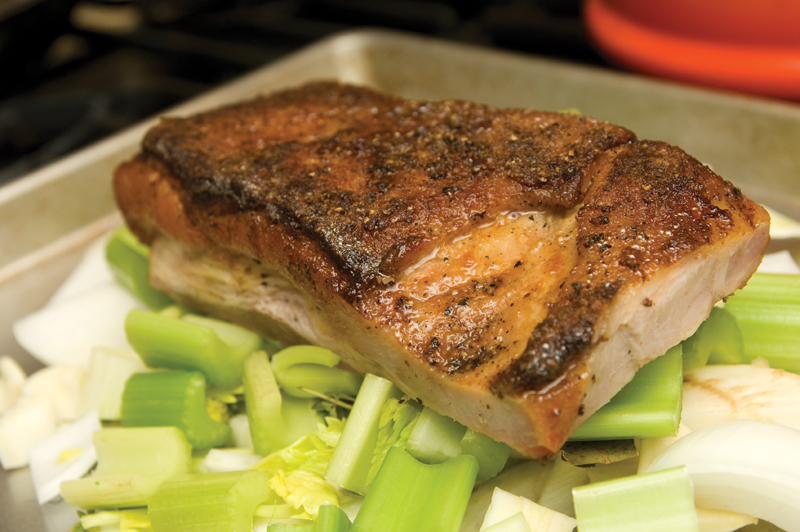 One of my favorite and what I can almost call my signature dish has been my roasted pork belly. Over the years I’ve developed the recipe evolving it to what I’m presenting for you today. This isn’t a simple recipe as it requires multiple stages of roasting and preparation. I change the brine for the seasons so it’s ready for any season, but this one will be perfect for the cooler months. Get ready for a few days of cooking, but remember that with the extra time comes one of the best pork dishes you can put in your mouth. You’ll soon forget about bacon when this cut of pork melts in your mouth and sends you salvia glands into overload. Step 1- Combine the first batch of ingredients in the deep Tupperware and whisk until the sugar and salt is dissolved. 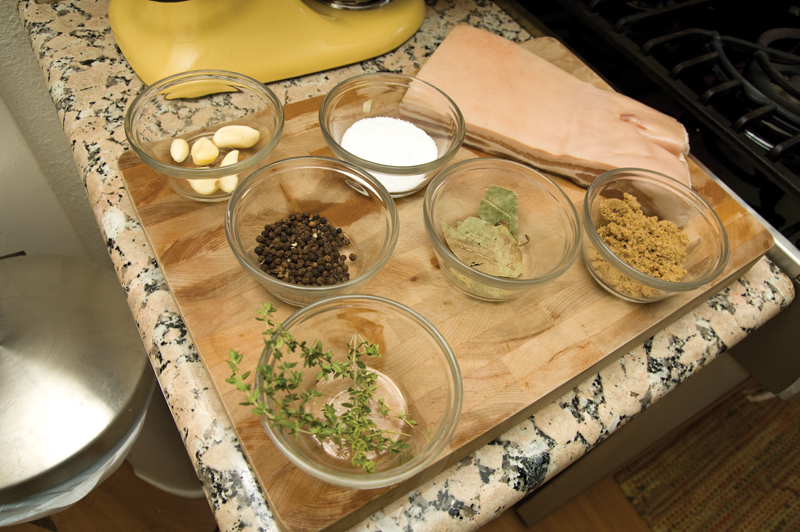 Place the pork into the brine and make sure it’s submerged. Place in the refrigerator for 24 hours. Step 2- Remove the pork from brine and rinse under cold water, then pat dry with a kitchen towel. Discard the brine. Step 3- Pre-heat the roasting pan over a burner to medium heat. Season the pork liberally on the fat side with salt & pepper, then place in the roasting pan fat down and lightly season with salt and pepper. 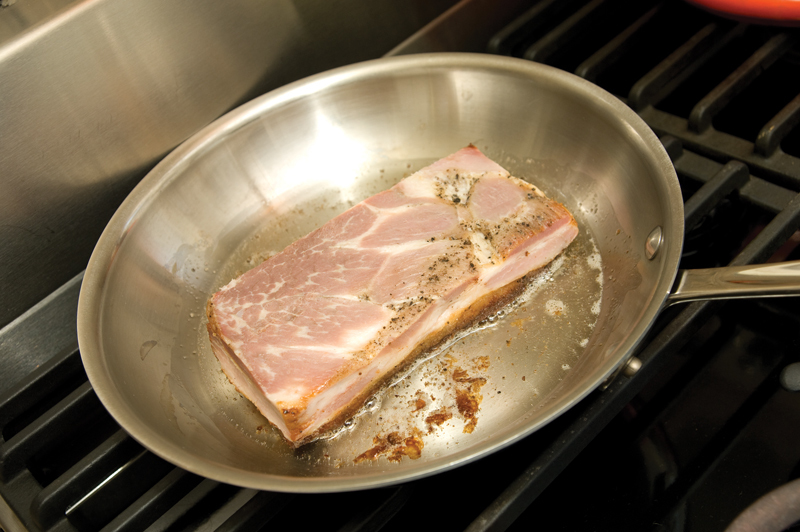 Continue to cook until the pork has rendered out most of it’s fat & become golden brown and crisp. 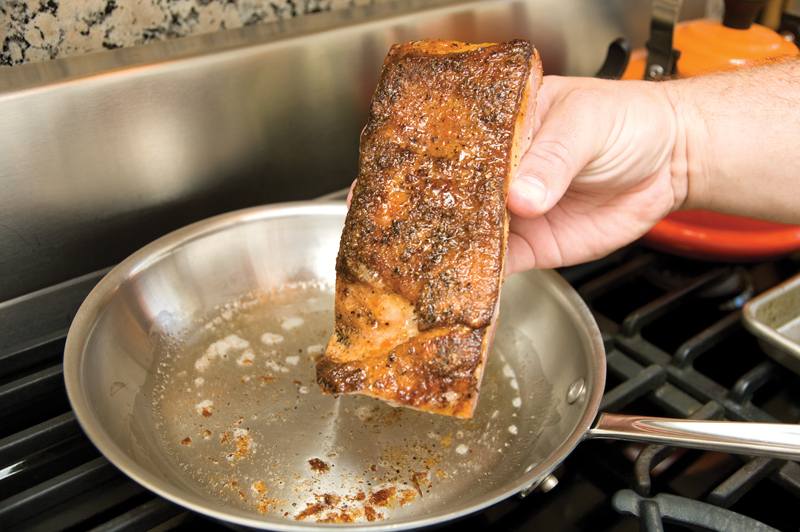 Remove from the pan and place meat down back on the kitchen towel. Step 4- Pre-heat the oven to 350f. Add all of the vegetables, herbs and beer to the roasting pan. Place the pork fat up on the bed of vegetables. Roast for about 4 hours or until golden brown & crisp. Step 5- Remove from the oven and let cool to room temperature, then place in the refrigerator uncovered. Step 6- The next day, heat a frying pan over medium heat. Add some pork fat and let come to a light smoke. Add the pork, fat down, and leave for 20 seconds, then transfer the pan to the oven and let cook for 15 minutes or until heated through. Step 7-remove from the oven and allow to rest for 7 minutes. Carefully portion and serve immediately. This is perfect for an entrée, meat for a sandwich, tacos, etc. 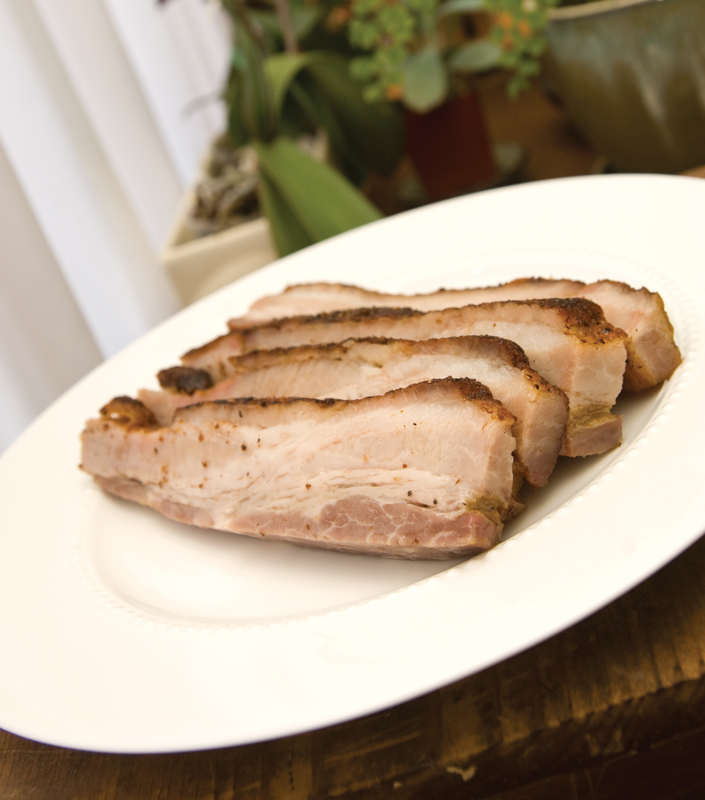 -you can eat it straight out of the oven, however allowing it to rest overnight allows the pork to cure. 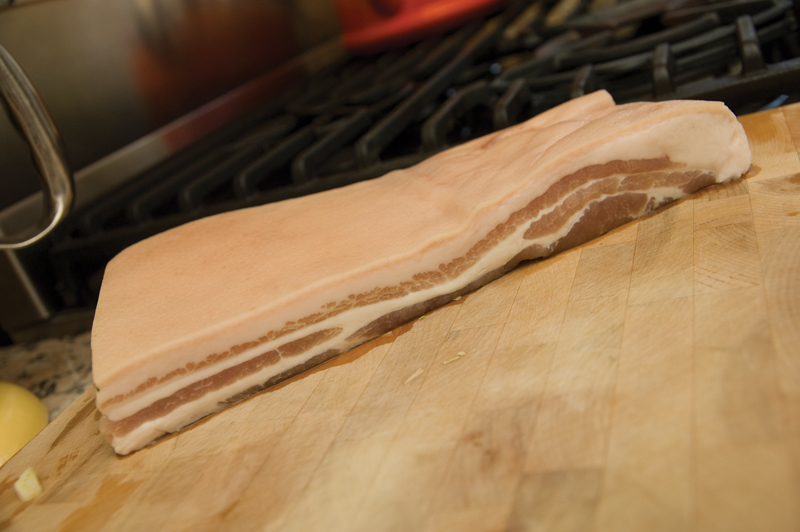 If you do cut into it you will lose a significant amount of that lovely fat and juices. 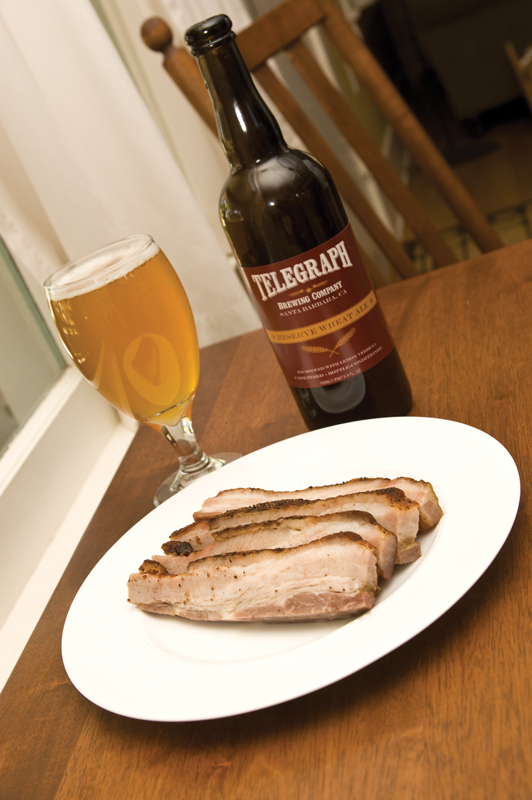 -you can use another beer, however as we know, pork & apples go perfectly together. If you are going to use another beer, try Belgian sour or brown pub ale.